As the Premier League release the 2014-15 fixture list Brendan Rodgers and his staff will be analysing them intently. High on his list of priorities will be identifying where those extra few points can be won. Surely this is his key task. Success in this area would see the Reds take that one small step to the title. The newest of footballing clichés speaks of ‘fine margins’. We are constantly reminded that the difference between success and failure at the highest level of the game can hinge on a poor refereeing decision, or one agonising individual error. Not that we need reminding. We saw plenty of that last season; Raheem Sterling incorrectly judged offside against City; Joe Allen missing a sitter at Goodison just for starters. Not to mention Luis Suarez being denied a penalty at Chelsea, or Kolo Toure gifting West Brom an equalizer at the Hawthorns. 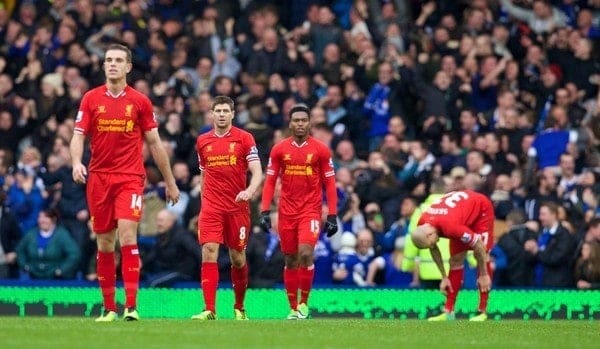 All of that was before Stevie’s unfortunate slip against Chelsea in the run in. If we could have put just a couple of those right last season, that ‘fine margin’ on the final day would have been overcome. The title would be in L4. Ifs buts and maybe’s. What’s gone is gone. Having said that there is a huge positive here if lessons can be learned. Against those sides outside of the top four last season it was pretty much one way traffic. There were notable slips against some, but for the most part Liverpool’s attacking style blew these teams away. It may not be impossible to go a whole season without suffering such mishaps, but it is very improbable. This for me is not an area where the Reds can look to bridge that gap. To achieve that we need to look at that mini league at the summit of the table. Last season we just didn’t do enough against the rest of the big four, taking just six points from the eighteen on offer. Overcoming this problem won’t be easy. Chelsea have already spent big on quality. Arsenal and Man City haven’t made their statement yet but they certainly will. United will probably improve under Van Gaal too, not that they’re part of the top four any more. Improving the depth and quality of the squad is a must. We should be able to attract the right level of player this summer. However, it will be tough to compete financially with City and Chelsea. While I can see us improving in this area, we are unlikely to completely match the quality of those squads. Recruitment is only going to take us part of the way to the top. The defence is also an issue and it’s not just personnel. The lack organisation of the back line played a huge part in the 51 goals we conceded. It also contributed to the large number of goals conceded as a result of unforced errors. The back four suffered from so many problems last time out. Replacing the keeper, Enrique’s injury, Johnson’s poor form, and the loss of Jamie Carragher perhaps put our frailties into context. There were also other issues. Cissokho and Toure were poor additions and Agger struggled to reach the heights of the previous season, while Sakho didn’t get the run of games he probably needed to settle. Rodgers has recognised this and pledged to “devote his life” to solving our problems at the back. We will surely see a more settled defensive unit next season and a renewed focus on discipline and shape. For this reason I would expect the defence to improve significantly. Will this be enough though? Or, is there yet another even “finer margin” that needs to be addressed? I think there might be. In my view the final barrier to taking that one small step may lie in our single-minded approach to the game. Don’t get me wrong, at times we have been breathtaking to watch under Rodgers. I would never suggest we return to the type of cautious football we have seen Liverpool teams play in the past. Under Brendan we have killed teams with blistering pace, sending our support into raptures and thrilling neutrals. In doing so we have racked up huge score-lines and put games beyond the opposition before half-time. Parking the bus is an anathema to Brendan Rodgers and rightly so. Having said that, had we taken nine points instead of six from the rest of the top four, number 19 would be in the bag now. Sometimes a draw is a good result. If we are to build on the undoubted success of 2013-14 we will need to address a hat trick of issues. We know the squad will improve. The manager has also correctly identified the defence as an area he will work on, but can Rodgers add tactical pragmatism to his arsenal this summer? 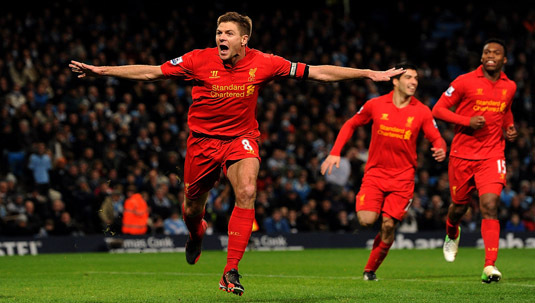 If he can, Liverpool’s one small step could prove a giant leap for all red kind.